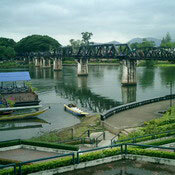 The Bridge over the River Kwai was built during World War II for the Japanese Army using Allied POWs. Altogether, 61,700 British, American, Australian, Dutch and New Zealand soldiers and a large number of Chinese, Vietnamese, Japanese, Malaysian, Thai, Burmese and Indian labourers were involved. Two bridges were actually built side by side. A wooden trestle bridge, which is no longer there, was completed in February 1943 and an eleven span steel bridge completed in April 1943. 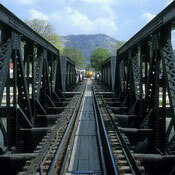 This bridge had been dismantled by the Japanese and brought to Kanchanaburi from Java in 1942. The central spans were destroyed by Allied bombings and rebuilt by British Army Engineers immediately after the war. It was part of the strategic railway linking Thailand with Burma. During the construction of the bridge over the Khwae Yai River - River Kwai as it is known among foreigners - the brutalities of war, disease and starvation claimed thousands of POWs lives. 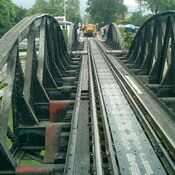 The bridge was immortalised in the book by Pierre Boulle entitled The Bridge Over The River Kwai and later in the movie of the same name. 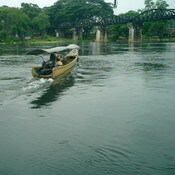 Unfortunately, he had never been to Kanchanaburi or he would have known that the railway does not cross the River Kwai. It actually crosses the Mae Klong River, so the Thai authorities simply renamed the river to aid tourism!